On this date in 1529, the city of Cologne burnt Protestant evangelist Adolf Clarenbach at the stake. Clarenbach (English Wikipedia entry | German) was a humanist-trained teacher who caught the Reformation spirit when he read Martin Luther’s On the Freedom of a Christian in about 1523. Luther’s words would kindle many a fagot in the years to come. Clarenbach got an early start assailing orthodox delicacies; he was dismissed from teaching posts and harried from city to city (German link, a handy little biography). Munster ran him out for agitating against idolatrous images of saints in 1523; Duke Johann III** personally ordered his expulsion from Jülich-Cleves-Berg; Osnabrück, Büderich and Elberfeld all gave him the boot before Cologne finally arrested him in April 1528. Clarenbach’s condemnation would only be secured by an arduous process stretching well over a year and contested by the heretic and his friends not only in theology but in law (Clarenbach, a layperson, disputed the ecclesiastical court’s right to try him and appealed successfully to an Imperial court against Cologne, dragging out the process) and in public opinion (Clarenbach’s supporters in Cologne published defenses of him). Even the actual death sentence took half a year to enact after it was issued in March 1529 while authorities loath to conduct it negotiated with their prisoner to moderate his heresy. He was finally put to death together with another Lutheran, Peter Fliesteden; they are among the first Protestants to die for their confession in the Lower Rhine. Given the Lutheran movement’s strong run in Germany, it’s no surprise to find this seminal martyr honored in many places in present-day Germany — and his name ornamenting a street in his hometown, a seminary, and a primary school. Luther signed that dedication on September 6, 1520. He had not been excommunicated at that point. Just a few weeks later, he received the papacy’s official (and none too polite) rebuttal to Luther’s 95 theses. Luther answered this missive much less temperately, and his breach with Rome was complete by January 1521. ** That’s Duke Johann of Cleves, the father of the Anne of Cleves whose unsatisfactory betrothal to Henry VIII precipitated the downfall of Thomas Cromwell. “In 1529, the Inquisitor General of Besancori, a Dominican friar named Jean Boin, visited incognito the village of Anjeux in the bailiwick of Luxeuil, Franche-Comte, and noted down the gossip of the villagers, which centered on 27-year-old Desle la Mansenee,” begins this vignette in the only part of Nigel Cawthorne’s Witches: History of Persecution that Google books preview will cough up. You know this isn’t going to end well. Our incognito Inquisitor swiftly decloaked and transformed Desle la Mansenee from grist for the neighbors’ grapevine into ash for their garden plots by torturing her into confessing to — oh, you know, the usual stuff. Dancing at witches’ sabbats and flying on broomsticks and banging the devil. That sort of thing. People, these are infernal agents. It doesn’t get any worse than that. You’ve got to use tough tactics to get information, not just start salacious rumors and hope they’ll come clean. On this date in 1529, Zwinglian missionary Jacob Kaiser was burnt at the stake in the Catholic Swiss canton of Schwyz. This otherwise routine Reformation martyrdom led Ulrich Zwingli, then Grossmünster of Zurich, to make war on the Catholic cantons, seeking to pry them open for further Protestant inroads. Let us be firm and fear not to take up arms. This peace, which some desire so much, is not peace, but war; while the war that we call for, is not war, but peace. We thirst for no man’s blood, but we will cut the nerves of the oligarchy. If we shun it, the truth of the gospel and the ministers’ lives will never be secure among us. The short-lived Erster Kappelerkrieg — the First War of Kappel — was won within weeks, swiftly concluded by a truce favorable to Zwingli’s Protestant alliance. 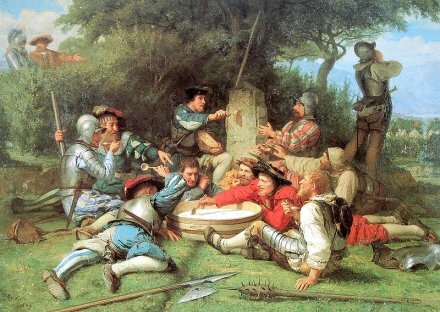 Die Kappeler Milchsuppe (1869) by Gemälde von Albert Anker. But this initially favorable return on poor Jacob Kaiser’s sacrifice was soon squandered. Hostilities between the two camps continued, eventually flaring into the Second War of Kappel. Zwingli was again spoiling for the fight, but his under-prepared Protestants were trounced by a Catholic league in October 1531. Zwingli himself died on the battlefield. 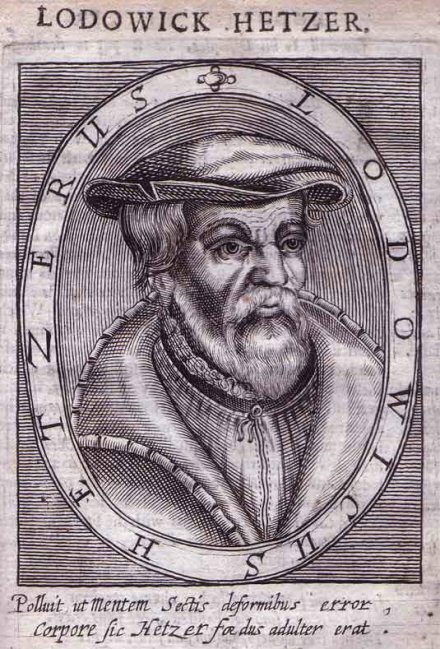 On this date in 1529, Biblical translator Ludwig Hätzer (or Haetzer, or Hetzer) had his head lopped off with a sword in the town square Konstanz (Constance) where he had first been ordained a priest. The charge against him was adultery … but his real crime was his Protestant radicalism. Haetzer, a Hebrew scholar, was of that first generation of church reformers who pushed dangerously beyond the reforms intended by more respectable types like Luther and Zwingli. The latter actually took Haetzer under his wing in 1523 for his erudite denunciation of religious imagery, and tapped him to help translate the Old Testament. But Haetzer started rolling with wilder-eyed types like Michael Sattler and getting thrown out of cities and the like. The young priest’s own thinking evolved over the 1520s towards a rejection of infant baptism, and sacraments, and marriage. There was also a sect among them the members of which wished, together with all things else, to have their wives in common; but they were soon suppressed by the other Brethren of the community, and driven out. Many inculpated Hut and Hätzer as leaders of this sect. If this be true, these men at all events atoned for their sin. According to Alcohol: A Social and Cultural History, Haetzer was even the first divine to publicly denounce boozing — in a German treatise available free online, On Evangelical Drinking. He wasn’t opposed to all corporal diversions, however. Protestant authorities in Constance arrested him for living in sin with Anna Regel. After his execution for sexual impropriety, anti-Trinitarian writings were discovered and judiciously destroyed; this biography claims that some Unitarians view him as their proto-martyr.